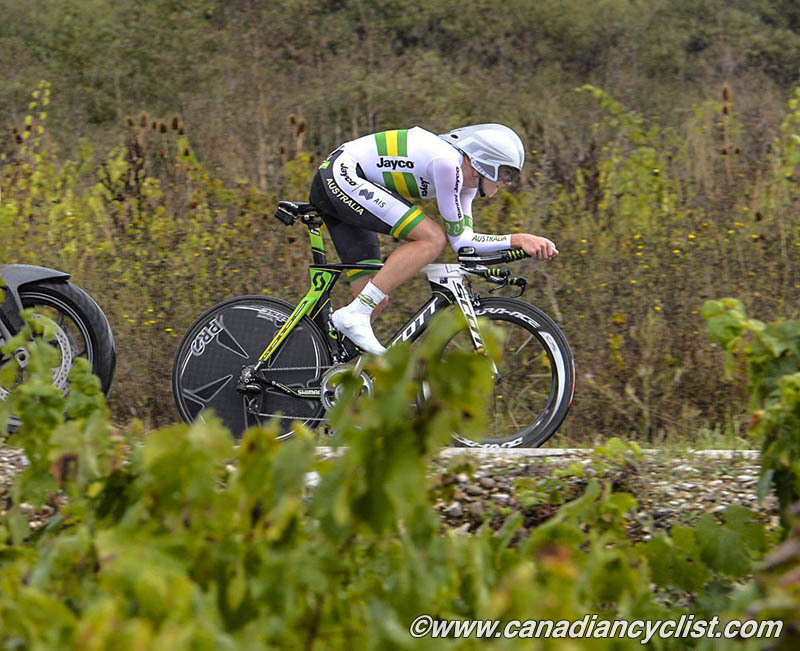 Day 2 of the Road World Championships in Ponferrada, Spain, saw the first individual time trial titles awarded, to the Junior Women and the Under-23 Men. 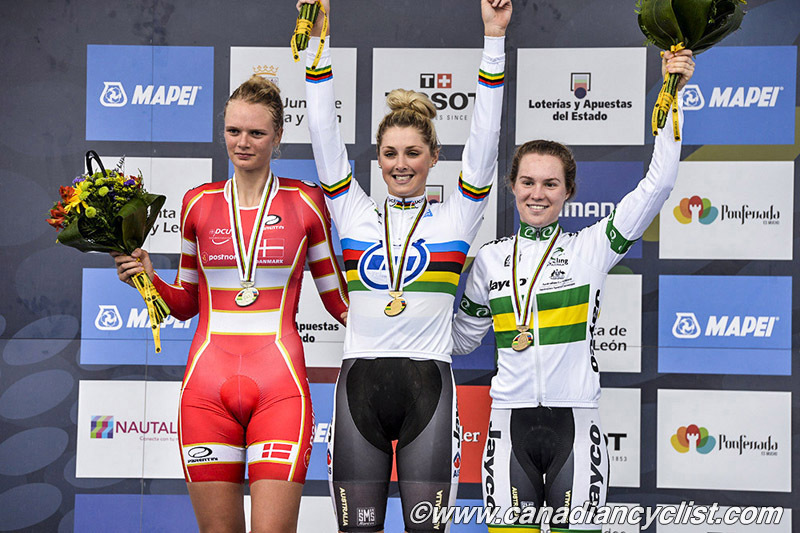 Australia was the big winner for the day, taking both world titles, plus the women's bronze. 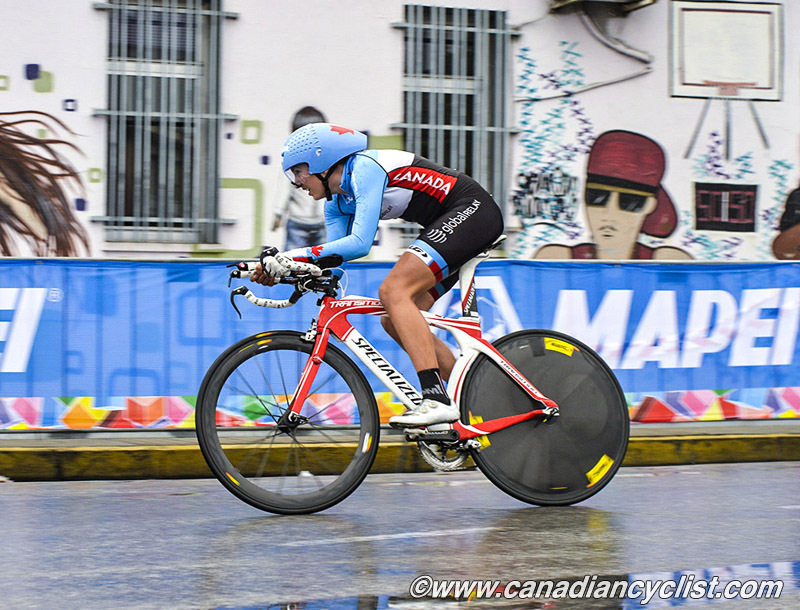 Canada had only one starter for the day, in the Junior women. The day started with pouring rain and, while it slacked off occasionally, the wet conditions persisted all day, make the roads slick and forcing riders to be cautious in the numerous sharp corners and on the final winding descent. Melissa Lowther (Great Britain) set the first sub-21 minute time for the Junior Women in their 13.9 kilometre race, as the seventh rider off out of 49 starters. 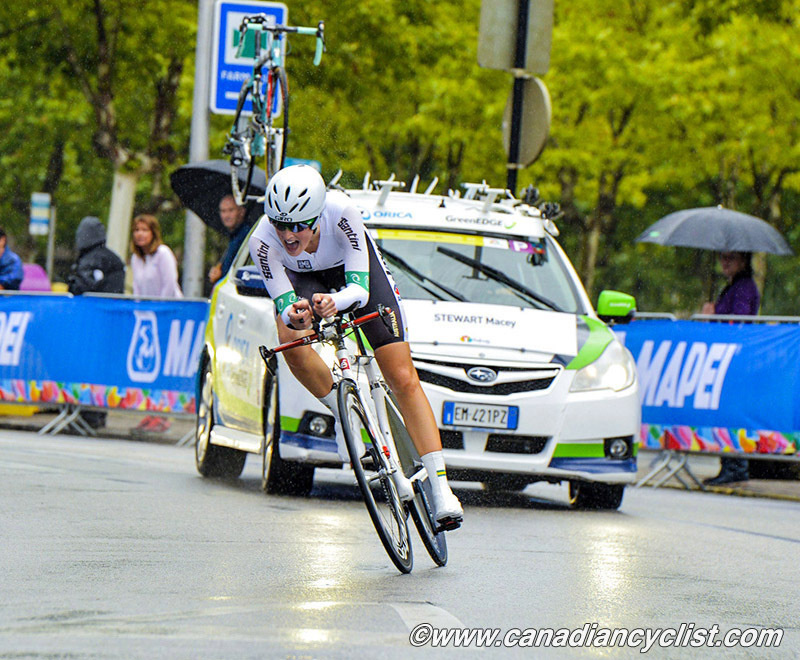 Her time would hold for nine riders, when American Emma White knocked just over a second off. White stayed in the Hot Seat until the halfway mark in the field, when Macey Stewart of Australia came in over 26 seconds quicker, with a time that proved to be untouchable. Pernille Mathiesen (Denmark) took the silver medal, 10.79 seconds back, with Stewart's team mate Anna-Leeza Hull a further 2.5 seconds back for bronze. Canada's lone entry was Dafne Theroux-Izquierdo, who finished 33rd. "I would say that I'm quite disappointed from my time trial," said Theroux-Izquierdo. "It really wasn't a good day for me, but it happens, and now I only have to leave that behind and focus on the road race on Friday!" In the men's race, Louis Meintjes (South Africa), the sixth rider off, was the first to go under 45 minutes for the 36.15 kilometre Under-23 Men's race, and the first to hold the lead for any length of time. He handed off 17 riders later to Portugal's Rafael Ferreira Reis, who held the lead through to the final nine in the 63 rider field. The middle of the fieldalso saw some of the heaviest rain of the day, which could have been a factor. Reis would only be bumped off the third and final spot of the podium by the last rider to finish. 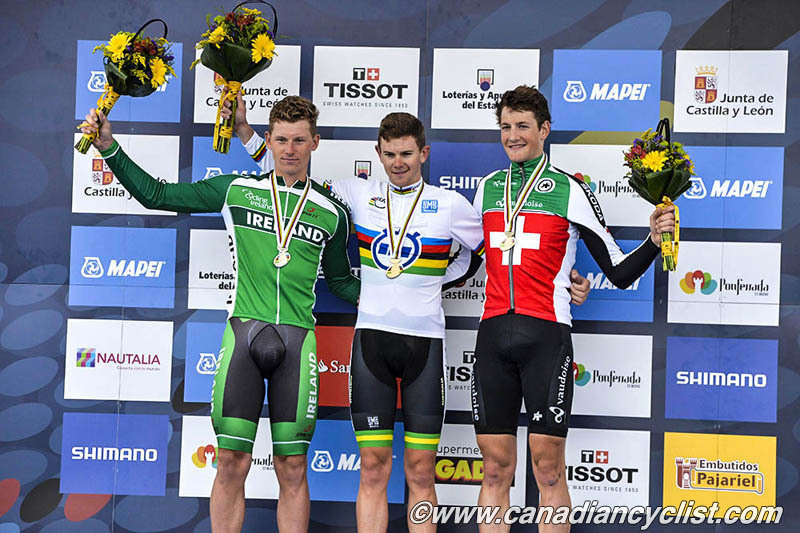 Ireland's Ryan Mullen finally took the lead at nine riders to go with the first sub-44 minute time. His time in the lead lasted until the third from last starter, Australia's Campbell Flakemore, bumped him by a minuscule 0.48 seconds to win the title. Stefan Kueng (Switzerland), the final starter, knocked Reisoff the podium to take bronze.